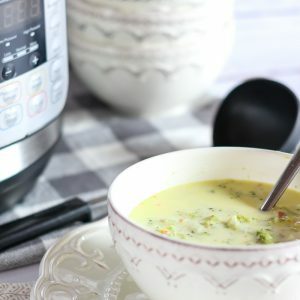 Thick, creamy and hearty are the words that come to mind to describe this Instant Pot Keto Broccoli Cheese Soup. It’s the perfect recipe to enjoy on a cold Winter day, and is ready in no time! Mother Nature has really given it to us this Winter. First with getting snowstorms as early as October, then with the Polar Vortex sweeping through putting us in the coldest temps I can remember. In fact, as I write this, we are under an ice storm warning because of a front coming through. 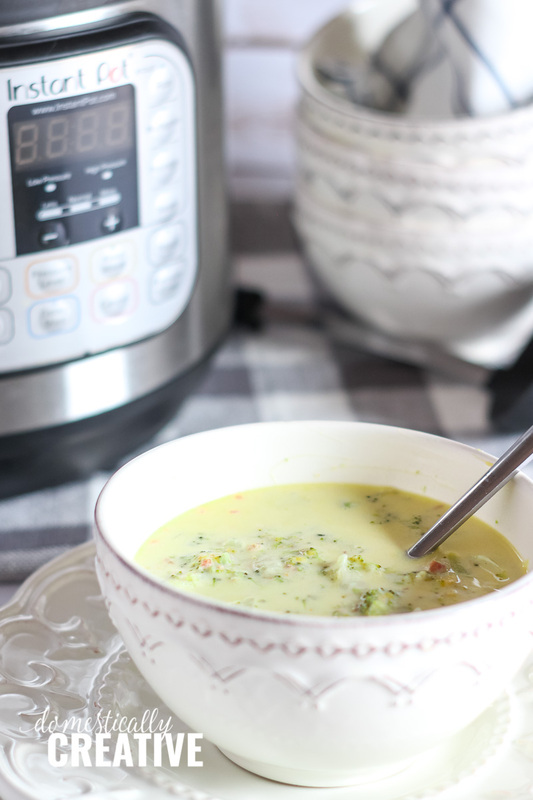 Needless to say, we have really needed this Instant Pot Keto Broccoli Cheese Soup to warm our bodies and souls. 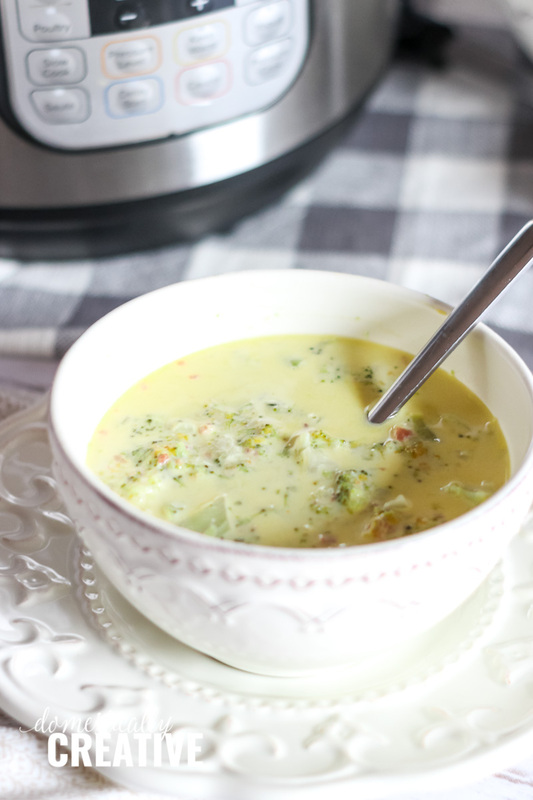 Besides warming up our souls, this amazing and simple Instant Pot Keto Broccoli Cheese Soup also has an unexpected, yet necessary, added ingredient. Like any good keto-er I added some crispy bacon to really boost the flavor. It’s simply perfect! 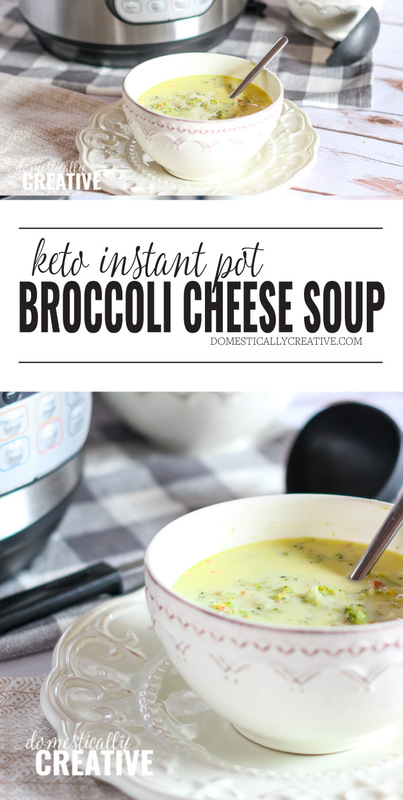 Before we get to the recipe, let me clarify just a few things and share a few tips I’ve learned when it comes to this Instant Pot Keto broccoli cheese soup. While this recipe is keto friendly, you can certainly still enjoy it even if you aren’t on a ketogenic diet. To lighten up the high fat content you could sub out the heavy cream for some half and half or even whole milk. Please note, however, that the soup will not be as thick and creamy. If you want it to be thicker, try adding a cornstarch slurry after cooking. You could also check out my more traditional recipe for Broccoli Cheese Soup. If you do not have an Instant Pot, don’t fret! 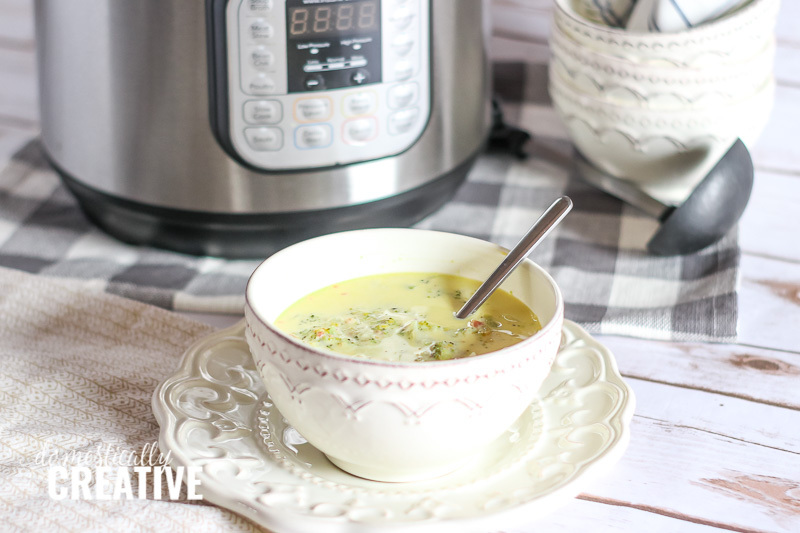 While I recommend this miracle kitchen appliance to everyone I meet, and I can’t believe I waited so long to get one, you most certainly can make this Instant Pot Keto Broccoli Cheese Soup in a slow cooker. I’ve included the instructions on the recipe card below just for you! I have tried making this recipe two different ways. The first is what is outlined in the recipe card below, and that is adding the heavy cream to the pot after pressure cooking. The second is adding the cream before pressure cooking. I was worried that having the cream in while cooking would scald or curdle the cream, however I’ve found that is not the case. I actually found this out by accident because I was rushing and not paying attention. As soon as the Instant Pot signaled it was through pressure cooking I’d realized my mistake. But to my amazement it turned out just fine, and in fact, makes the soup thicker than if added in after cooking. Use your own judgement though! While the Instant Pot is doing its thing, cook your bacon in the oven! Less mess and less bacon smell throughout the house. Set the oven to 375 and place bacon on a foil lined baking sheet. Bake for 20-25 minutes depending on the thickness of the bacon and desired crispiness. It took us awhile to jump onto the Instant Pot bandwagon (I’m always slow to try new trends) but I am 1000% hooked! This little appliance is seriously a life and time saver. I was crazy skeptical about it, and admittedly a little terrified of it. But, I have fallen in love and use it just about every chance I get. It’s the best addition to our kitchen since our Crock Pot! 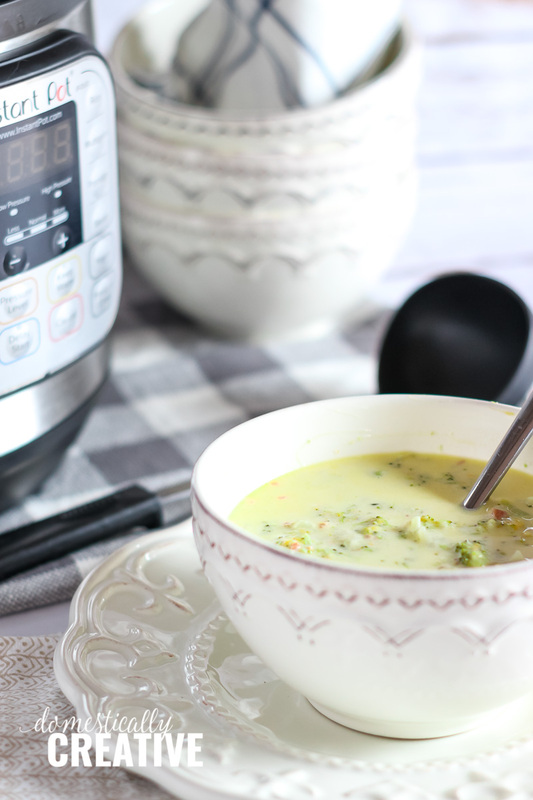 Thick, creamy and hearty are the words that come to mind to describe this Instant Pot Keto Broccoli Cheese Soup. It's the perfect recipe to enjoy on a cold Winter day, and is ready in no time! Add all ingredients minus cream, bacon and cheddar to the inner pot of the pressure cooker. Stir to combine. Close lid and close off vent. Select Soup and Normal pressure. Set timer to 10 minutes. It will take the pot 10-15 minutes to build pressure before cooking time starts. After pressure cooker is finished, allow steam to natural release for 10 minutes. Then quick release the rest of the way. Remove inner pot from cooker (it will be hot so use caution!) and set on a hot pad. Stir in cream and bacon. Then use a whisk and slowly stir in cheddar cheese in small amounts to prevent clumping. Allow to sit for about 5 minutes to give the cream and cheese time to thicken the soup. Make sure you read the tips outlined above before cooking! Add all ingredients minus cream, bacon and cheddar to the pot of a Slow Cooker. Cook on high 4 hours or low 8 hours. 30 minutes before cooking is through, stir in cream, cheddar and bacon.